11″ x 8-1/2″, softcover, 298 pages, 229 color illustrations, Routledge. 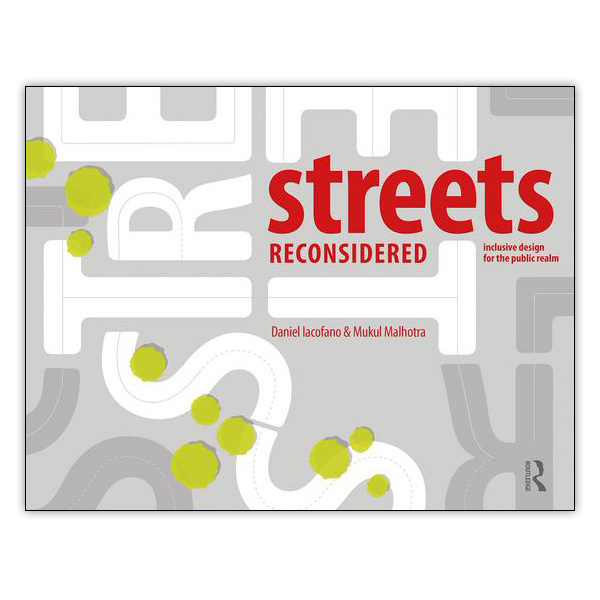 Streets Reconsidered provides a roadmap to redesigning city streets for living, along with driving — Streets that accommodate people of all ages and abilities, using all travel modes, and promoting healthy urban living, social interaction, enhanced commerce, and environmental sensitivity. The book is divided into six main sections each reflecting an important role for contemporary streets These are: Flexible streets, Social streets, Shopping streets, Play streets, Growing streets, and Resilient streets. An introduction to the core concepts and benefits of each street type. Case studies showing the concepts in use. The cases are fully illustrated and include photos and measured plans and elevation schematics to show how the street works. Cases are largely based on examples from North America but also include notable examples from around the world. Best practices. Based on the case studies and the authors’ work, the best practices section describes and illustrates important techniques and lessons learned. The book brings together in a single volume much of the material compiled for the re:Streets website. With the same emphasis on detailed illustrations and bite-sized nuggets of text, it packs a wealth of information in a very readable format. Daniel S. Iacofano, PhD., FAICP, FASLA, has over 30 years of experience in regional and land use planning and community-based urban planning and design. Dr. Iacofano has worked with hundreds of communities across the United States, helping them strategically plan for positive change. Mukul Malhotra has over 20 years of experience in urban design, planning and architecture in India and the United States. Mr. Malhotra is one of the creators of “re:Streets,” the multidisciplinary collaboration focused on planning, designing and constructing streets as a method for improving the built environment for everyone. Streets Reconsidered is guaranteed. If you are not 100% satisfied, you may return it within 30 days for a full refund.